I like a lot of things, guys and girls. I like comic books, as the title of this post attests to, but I also like Marvel, and movies, and mythology. Taking all of that into consideration there is absolutely no reason why I shouldn’t have liked the sequel to 2011’s Thor. I mean, that film took The Warriors Three, consisting of Hogun the Grim, Fandral the Dashing, and Volstagg the Voluminous [i.e. fat], and cast the Japanese actor Tadanobu Asano as the former. I should hope that you know my feelings about racially diverse casting by now, but really the expressions below sum them up pretty nicely. From left to right: Hogun, Fandral, and Volstagg. I love comics. In no way should this be a surprise to anyone who’s given this blog more than a passing glance. I also love television a lot, and when the two happen to overlap you can be assured that you have my undivided attention. Yesterday I wrote a little bit about Bleeding Cool’s response to The Big Bang Theory episode “The Bakersfield Expedition”, half of which revolved around the premise that the show’s female cast would be entering a place traditionally closed off to their gender. I was able to catch the show last night and have many thoughts, but my ultimate conclusion is this: It really wasn’t that bad. Which did not please me. Having given it a second viewing, however, I realize that it’s a believable response and the perspective many people still have on the medium today. Bernadette suggests that they try to become a part of their significant others’ lives by seeing what the big deal with comics is, and soon they’re all off to their LCS [local comic store]. But it’s a quick gag that thankfully doesn’t overstay its welcome. Owner of the store and new series-regular Stuart is quick to chastise his socially awkward clientele and is soon talking to the girls about comic book recommendations. Amy’s direct approach of asking “Alright, well who’s the best super hero?” and Stuart’s haste to nip that line of questioning in the bud was fantastic. There isn’t really any media that’s cut and dry as far as what “the best” is, and his whispered “What do you want to do, start a riot?” communicated well that this is a pretty contentious topic in certain circles. 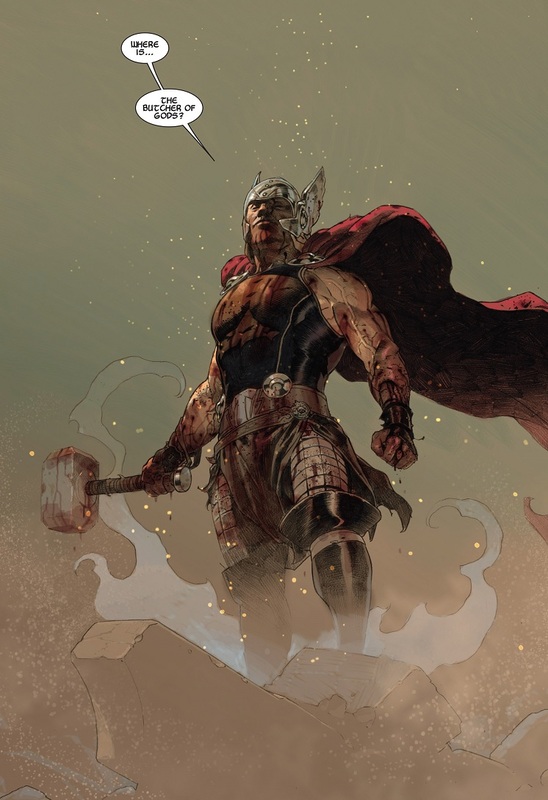 This upset me when I first watched it, but upon finding out the title was Thor, God of Thunder #2, written by Jason Aaron and illustrated by Esad Ribic I was dumbfounded. The Big Bang Theory has always been really good about keeping their comics contemporary, and the stock in Stuart’s shop actively changes to keep up with what’s new on the stands, but this was something else entirely. Aaron’s new Marvel NOW! title follows the character as he grows from a young, brash god to the hero we all know today and then further on to his role as the future king of Asgard. It’s masterfully written, and features artwork like this jaw-dropping splash page [which also happens to be my current desktop wallpaper. I’m willing to assume, probably correctly so, that the show was in no way actually referring to anything in the actual book [though it would not surprise me to have an entire page featuring the single word “Krakka-DOOM” in a Thor title]. Then, as the three gripe about the waste of time that is their boyfriends’ [and husband’s] pastime, Bernadette notes that “It’s crazy, they spend hours arguing about things that don’t even exist!” And then things get interesting. Penny mocks the idea of a “hammer so heavy that no one else can pick it up” and then before you know it the girls are deeply debating the fundamentals of who or what can wield Mjolnir. Wonderful. I say that without a trace of sarcasm. Bernadette: Red Hulk must be worthy. Penny: How can Red Hulk be worthy? Bernadette: You don’t know his life! If there was any laugh-out-loud moment of this entire episode that was it. Coming away from watching “The Bakersfield Expedition” for the second time [which I did to write this post] I have to say that I quite enjoyed exactly half of it. Absolutely no part of me was invested in the guys trekking [ah ha] around the desert as a Federation landing party. What I was interested in was watching three characters, formerly wholly unfamiliar with comic books, arguing intensely about a matter which, and I’ll be honest, is not important in most senses of the word. While The Big Bang Theory has often taken the nerdier passions and portrayed them in a fairly mockable light, it was certainly not so in this episode. Yes, comic books were referred to as something for twelve-year-olds, but Stuart does a great job in telling both the girls and the audience that it’s a broad, diverse medium that has beautiful illustrations and excellent writing, as well as a little eye candy for the ladies. Rich Johnston at Bleeding Cool thinks they did a passable job at addressing comics, but continues to assert that it’s still The Television Show That Hates [Comic Book Fans]. The episode review over at The A.V. Club’s TV Club actually referenced the Bleeding Cool movement [which you again read about in yesterday’s Fame Day post] and similar to what I did focused mainly on the girls’ plot for this episode. The comments section of that review go over the age old conversation of how the show treats its subject material and its potential audience, but that is another post for another day. All I have to say is that I was pleasantly surprised by the episode, and enjoyed it much more than I thought I would. I also finally received the second volume of Mark Waid’s Daredevil, so this is not a day on which I can feel unhappy. 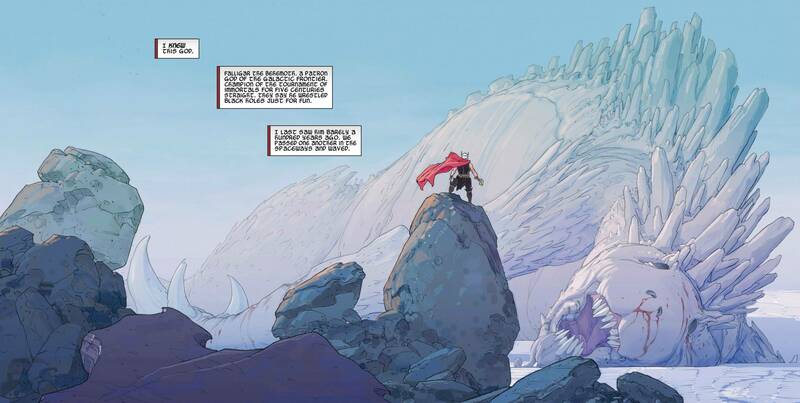 Here’s another picture of Thor from Issue #4 of Aaron and Ribic’s title for all you lovely people. Today’s Fame Day post is dedicated to the artistic genius of Kris Anka. I’ve been following his work on the superhero redesign blog Project : Rooftop for some time, and was thrilled to see him get the recognition he deserves on ComicsAlliance yesterday. Apparently Anka had been hired by Marvel to design the costumes for the new Uncanny X-Force series, and he puts his own spin on the new roster of Storm, Psylocke, Spiral, Puck, Lady Fantomex, and their nemesis Bishop. The biggest changes are in Psylocke losing the unitard for more of a full body suit, and Storm reverting to her 90s look with a fantastic-looking mohawk. Utility was definitely prioritized, and story as well. Working with Uncanny X-Force writer Sam Humphries it was decided that the grey in Spiral’s outfit should be opaque. This fit with the knowledge that Spiral was a character was “a little more confident in her sexuality,” without making the costume’s raciness over-the-top . The costume themes were something from the very beginning that I wanted to strive for. I felt that every costume should not only highlight the personality of the character it is wrapped around, but also of the function that the costumes will serve towards. At the end of the day, these costumes have to look like they can get into a tussle, and actually be able to handle it. This certainly translates over to the many other redesigns that can be found on his various art blogs, and one I want to highlight is his version of the Avengers. From left to right: Iron First and Crystal, Ares and Ms. Marvel, Iron Man and Venus, Bucky (Winter Soldier) and Thor. In another illustration, entitled “avengers – dont f-ck with us,” the entire team is explained in the description, with the idea that he wanted his Avengers to be “a family first off.” Ms. Marvel acts as leader, Venus as a strategic asset, Ares carries Stark-designed weapons that can collapse in on themselves. Every design point has a reason, and it all adds up to clean, recognizable costumes. His redesigns for DC’s trinity [Superman, Batman, and Wonder Woman] are images I go back to over and over. His vision of the the Last Son of Krypton shows that you can do away with the red shorts over blue tights, provided you break it up with a little bit of colour [the yellow buckle, the red lines on the side]. I’m looking at you, costume designer for Snyder’s Man of Steel. 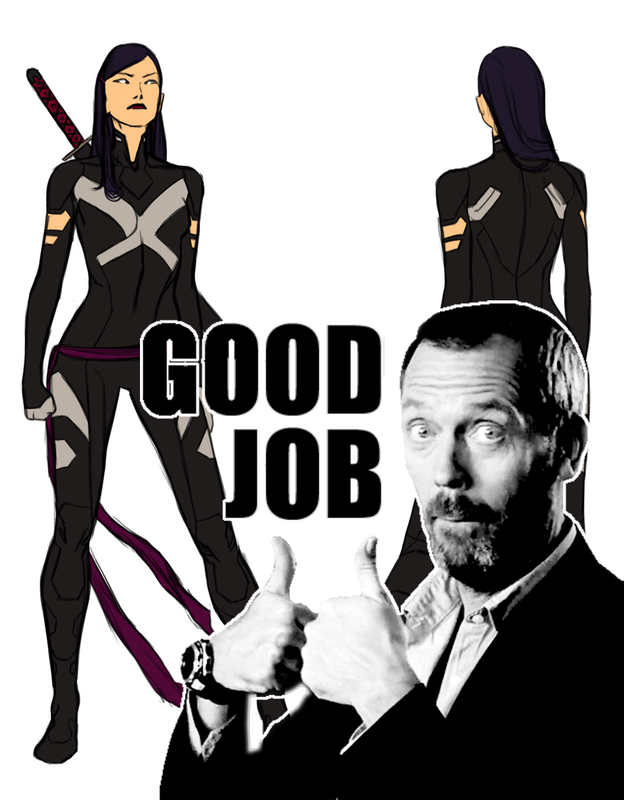 All in all, Kris Anka is a name to look out for. In the ComicsAlliance interview Humphries admits that “My only wish is that we could keep going until we redesigned the entire Marvel Universe!” If only that were true. And don’t forget to search for his stuff on Project : Rooftop!